Remploy – Not for Sale! Mid Yorkshire Unison members and public supporters lobbied Mid Yorkshire NHS Trust board meeting held on 14th June. Following a 97.4% vote for strike action on a 58% turnout, a strike will proceed if the Trust does not back down from it’s plan to transfer estates & facilities workers out of the NHS. Demonstrators were invited inside the Trust headquarters to address the board. Some of the board members seemed surprised that staff strongly supported striking against back door privatisation. Despite assurances that staffs views would be seriously considered the board is using ‘commercial confidentiality’ as an excuse to make decisions in secret. Union members are determined to resist being removed from the NHS. The strike will follow if the Trust does not drop this ‘proposal’. Four Yorkshire branches of health union Unison are balloting simultaneously for strikes against plans to transfer estates and facilities workers into separate companies – owned by NHS trusts, but outside the NHS. Calderdale and Huddersfield, Bradford, Leeds, and Mid Yorkshire plan coordinated strikes across West Yorkshire if the trusts do not back down. Up and down England, NHS workers are organising against similar plans. The companies are called ‘special purpose vehicles’ or ‘wholly owned subsidiaries’. Trusts use them to avoid paying VAT and employ staff outside nationally agreed terms and conditions. Unison members struck for 48 hours at Wrightington, Wigan and Leigh NHS Trust on 23 May against transfer into a company called WWL Solutions. Hundreds attended the picket lines outside the hospitals, determined to fight to remain in the NHS. NHS bosses thought they could move the staff over into new companies under ‘Tupe’ transfer law without a fight. They have been taken by surprise by workers’ determination to retain NHS employment. Mass meetings, petitions, lobbies and indicative ballots have been held across the country. They have attracted support from other health workers and community groups, who rightly see this as yet another step towards the privatisation of the NHS. The struggle is showing that low-paid workers are prepared to fight for their terms and conditions and their status as NHS workers. The lesson from Yorkshire is that we are stronger when we organise together and fight together. On the weekend of the release of the new Star Wars film, protests across Yorkshire took place in solidarity with striking cinema workers in the Picturehouse chain, who are currently engaged in a two-year long dispute to win a living wage. The Picturehouse workers, members of BECTU, starting from the Ritzy cinema in London, have been taking action on a series of issues including union recognition and payment of the London Living Wage. Picturehouse had agreed to their demands, but since reneged on that pledge. Socialist Party members took part in the protests outside the Wakefield Cineworld site and outside the White Rose Centre where the new Leeds Cineworld is based. A little over a dozen local trade unionists supported both events and received strong public support for the campaign. It was planned for 10 March, just days after the anniversary of the end of the 1984-5 miners’ strike. Given the role of the Tory party under Thatcher in running down the mines and forcing the 1984-85 dispute in order to break the power of the miners – then the most combative and best organised union – many local people saw this as an insult to the whole point of a museum commemorating the industry. At first museum management put up a defiant statement that they would be going ahead as they had to be ‘politically neutral’! But just a day later they were forced to cancel the event after the catering company withdrew. PCS members at the Wakefield Driving Test Centre began two days of strike action on Monday 4th December against attacks on their terms and conditions of work as part of a national dispute. Whilst much of the media coverage has focussed on the strike being on the first day of the new driving test, which part of the dispute covers some issues with it, most of the pickets anger was focussed around the ‘flexible’ working arrangements management are attempting to impose on them. This includes being able to deploy Ops staff to anywhere they choose without notice, but on top of this that the time taken by staff to travel to these deployments is to be done on their own time! This also means that staff travelling to such deployments wouldn’t be covered by the Civil Service Injury Benefits Scheme. There are other issues such as around test schedules facing staff, and also including removal of premium payments for working voluntarily beyond their contracted Monday-Friday hours, similar to attacks taking place in the retail and other sectors as well. Despite this being the first strike for some picketers, they were well equipped with a gazebo and bacon butties and hot drinks and pickets were bouyed by the news that there were no tests booked in at the site on Monday – DVSA offering for the first time in an industrial dispute to allow those booked in to cancel or re-arrange for another day. Argos workers, members of Unite the Union, finished the 3 week period of strikes they’ve been engaging in over issues around relocation and redundancies today. In Castleford, this is a key issue as many of the workers have been long- term employees accruing a significant redundancy package if they were made redundant. Their fear is that transferring their work to another site out of reasonable commuting distance would rob them of that security. Strikers were clear that of Argos won’t budge then there more than prepared to take further action. The strikers want to thank those who have sent support for them and concluded their picket line by taking a solidarity photo in support of the McDonald’s workers who are on strike for the first time today over working conditions, zero hour contracts and low pay. Workers at four Argos distribution centres across the country, including the Castleford site, are taking 3 weeks of strike action to defend jobs and terms and conditions in the wake of the Sainsbury’s buying out Argos last year. The action has been prompted by the company’s decision to close their Magna Park site and transfer workers to Kettering, around 30 miles away. Workers are concerned that further re-organisation could be coming in the distribution network, and although they have redeployment clauses in their contracts, they are seeking agreement about reasonable distances workers could be expect to be redeployed. They are also seeking agreed relocation and redundacy packages for any transfer beyond an agreed reasonable distance. For the first week, support has remained strong amongst the 100+ permanent workers at the Castleford site. 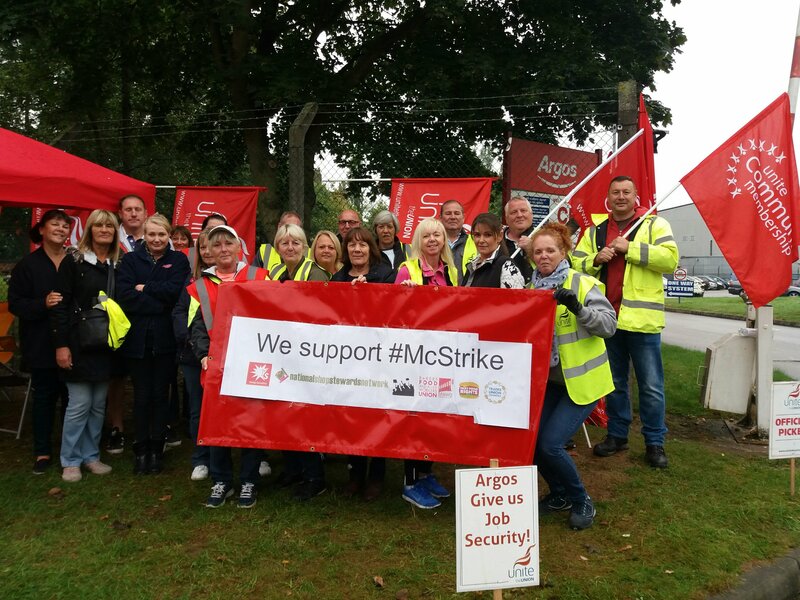 Despite management attempts to get workers from a neighbouring DHL-run Argos warehouse to cover the strikers workers, workers at that site, members of Usdaw, have correctly refused to do so. In Argos stores as well, organised by Usdaw, there has also been concern about what the merger with Sainsbury’s means for staff with Argos stores located in close proximity to Sainsbury’s. In a retail distribution sector which increasingly is dominated by contractors such as Wincanton, DHL Eddie Stobart and others, defence of in-house distribution networks, where the actual employer can be more directly held to account is vital. This is why workers at the Argos site in Barton are also seeking to join the other four sites as part of the bargaining group. A victory in this dispute is important to send a message to those in the distribution sector that workers will not be pushed around and provide a basis for a push to ensure that distrubution contractors are organised on the same terms and conditions of in-house staff, or ideally brought back in-house.